Need clarity on what to do next? It is not that there are no options, or nobody give you advice. On the contrary, the choices can be overwhelming. What is important is knowing what is right for you in your season. Say "NO" to the noise and "YES" to your life. Joel Boggess has Master's degrees in counseling and business. He has been a life and career coach since 2006. In addition to his own journey, Joel offers a number of real-life accounts of the growth and success his clients have experienced. These stories bring to life the truths he offers. 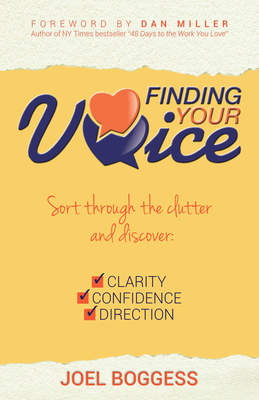 Highly relatable and immediately applicable, Finding Your Voice will help you get back in touch with the real you to live your best possible life. As an author, life coach, and online radio host, Joel Boggess teaches professionals and women on-the-go how to find clarity, confidence and direction; even if they feel stuck, overwhelmed, or unchallenged. With a Master's degree in counseling and many years' experience working one-on-one and with special interest groups, Joel has the know-how, skill, and wisdom, to help you tune into and fully express your voice. Joel Boggess is the go-to guy for clarity, confidence, and direction.